It is 07 hrs drive from Delhi. Upon arrival in Shimla, Grand Tours India Representatives will greet and assist you to transfer to the hotel. Spend rest of the day at leisure. Dinner and overnight stay will be at hotel. Adventure and sports have tremendous potential towards promotion of tourism. They have always been an integral part of tourism. They cater to the carving of humans for recreation, enjoyment and adventure. A wide range of sports, leisure activities are available in India. Himachal Pradesh is such a place where a wide range of adventure and sports are available. Chamba is beautiful town in the scenic valley of Himachal Pradesh. 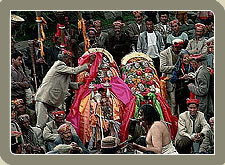 Chamba was founded by Raja Varman who named the town after his daughter Champawati. Located at the distance of about 56 km from Dalhausie, Chamba is one of the best hill resorts and one of the most popular tourists in India. Travel by surface from Delhi to Manali. Upon arrival in Manali, Grand Tours India Representatives will greet and assist you to transfer to the hotel. Dinner and overnight stay will be at hotel.